And the best thing about this discovery was that it wasn’t just interesting from a historical viewpoint. It also reveals some important content marketing lessons that need to be applied today, more than ever before. I had come across an old digital version of a book from 1918 called, Field of Advertising. It wasn’t the most exciting book I ever found, so I wasn’t intending to discover anything important. I was reading it more out of curiosity than anything else. And that’s when I made my accidental discovery. I couldn’t believe what I was reading, but there it was right before my eyes: The first in-house publication (i.e., evidence of content marketing) was Benjamin Franklin’s Poor Richard’s Almanack — a publication advertising Benjamin Franklin’s print house. 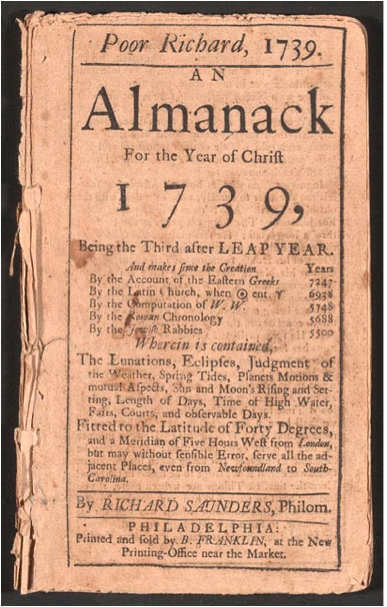 Poor Richard’s Almanack, which Benjamin Franklin began publishing on December 28, 1732, and went on to publish for 25 years, was created for the purpose of promoting his printing business. And get this: He did such a great job at creating needed, valuable, and entertaining content for his audience that the content marketing itself became recognized, respected, and successful on its own. How popular was it? He sold as many as 10,000 copies a year, making it a bestseller of its day. Why was I so excited to come across this? Up until this point, the earliest known content marketing example I’ve heard of was either August Oetker’s cookbooks that were content marketing for his Backin baking powder (1891) or John Deere’s magazine, The Furrow, which served as content marketing for the company’s farm equipment (1895). That means this content marketing example from Benjamin Franklin is 159 years older than the earliest known examples that had previously been cited! If you don’t do these things, you’re just creating more fodder for filling the online content wasteland. If you’re creating that type of content, then don’t worry about it showing up in search engines: Even if it does, no one will bother reading it! Your goal should be to create the absolute best content possible. Otherwise, you shouldn’t even bother. In 1732 I first published my Almanack under the name of Richard Saunders; it was continued by me about twenty-five years, and commonly called Poor Richard’s Almanack. I endeavoured to make it both entertaining and useful, and it accordingly came to be in such demand, that I reaped considerable profit from it, vending annually near ten thousand. Do you see what his main goal was? It wasn’t to slip in as much self-promotion as possible. It was to create entertaining and useful information.That is what our goal as content marketers must be, as well. 2. Create content that your prospects and customers want — especially if it isn’t focused on your business: You must not only create great content, but you must also create content that your desired target group is craving and searching for. And this might seem counterintuitive, but the most powerful kind of content for you to create might actually be content that doesn’t directly focus on your business or industry at all. Think about it. Benjamin Franklin could have focused on creating a magazine with “Tips on How to Create Effective Advertising Posters.” He could have created a booklet on “10 Secrets Printers Don’t Want You to Know.” Or any other type of content directly related to his business. Be like Ben: Discover the types of content your prospects and customers crave, and create those types of content for them (either on your own or by partnering with an expert in that niche who can create quality content on behalf of your business). 3. Become an information connoisseur for your audience: Franklin didn’t create all of the content in Poor Richard’s Almanack. For much of it, he was what we’d call a content curator. His almanac contained the type of information most almanacs contained: a calendar, weather information, poems, and even astronomical and astrological information. But he made his almanac different by including unique things like math exercises, early examples of demographics, and even personal sayings. I considered it as a proper vehicle for conveying instruction among the common people, who bought scarcely any other books. I therefore filled all the little spaces, that occurred between the remarkable days in the calendar, with proverbial sentences, chiefly such as inculcated industry and frugality, as the means of procuring wealth, and thereby securing virtue; it being more difficult for a man in want to act always honestly, as (to use here one of those proverbs) It is hard for an empty sack to stand upright. You can and should be an information connoisseur like Ben. With the content avalanche that is taking place these days, it is needed more than ever. But make sure that, as you implement content curation, you always make sure to add your own voice and opinions. 4. Don’t forget the magnetic power of serialization: One of the things that made Poor Richard’s Almanack so popular was that it contained “news stories” that were presented in a serial format. That means that the readers had to keep purchasing a new version of the Almanack each year to see what happened to the main news characters. One of the earliest examples of how Franklin used the power of serialization was the prediction that his “good friend and fellow-student, Mr. Titan Leeds” was going to die on October 17 of that year. In a later issue, Mr. Leeds himself responded and said that he thought that he would die on October 26th, not on the 17th. Franklin then encouraged his readers to purchase the next year or two of editions if they supported his prediction. And to build suspense the next year, Franklin expressed his disappointment that he was too sick to find out whether he or Leeds was actually correct. People kept buying future issues to learn who would ultimately be right. People love cliffhangers and teasers. Think of some of the most popular shows on TV these days — Once Upon a Time, Believe, and Resurrection, just to name a few. What do they all have in common? They’re all serials! Each episode builds and adds to the story, drawing the viewers in and keeping them watching. We need to use this same tool that our old buddy Ben did. You can do this by creating series of articles or blog posts and by using teasers and cliffhangers at the end. This will allow your posts to be more than “one-offs” that grab your audiences’ attention and then just as quickly lose it. Instead, serialized content builds momentum from one post or article to the next. Never forget that technology changes constantly, but in general, people do not change. Their collective desires, needs, and even their idiosyncrasies have all remained much the same throughout the centuries. Keep current on the content marketing tools and trends that are out there, but don’t ever let yourself lose touch with those methods that have always worked, and always will: evergreen methods, like the ones that Benjamin Franklin used, that are based on the unchanging desires and needs of people everywhere — not on the tools or the trends of one era. Looking for more inspiration on delivering compelling, quality content? Read CMI’s Content Marketing Playbook: 24 Epic Ideas for Connecting with Your Customers.